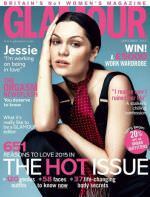 Jessie J appears on the cover of the January 2015 issue of Glamour UK magazine. She talks about her song Bang Bang, moving to America and writing Party in the USA. Party in the USA paid my rent for, like, three years. Actually it was longer than that. That’s where I get most of my money. I write songs. I’m a singer. I love doing endorsements and stuff, but that’s all added on.